So you’re looking at buying a new espresso machine. You want something that guarantees a great experience, but also won’t break the bank. The $200 price point is what I think of as the sweet spot for quality, entry-level machines with enough features to satisfy your love of espresso but without being overwhelming to master. I also didn’t have a massive budget for a machine when I started getting into home brewing. The $200 range is a common, respectable budget for newbies with an appreciation for great coffee who are just starting out. The Final Shot: The De’Longhi EC702 is the top pick for this range. Effective self-priming, a well-made and easy to manipulate frother and stainless overall construction are top features. This is a great pick for home baristas who don’t need too many hands-on features, but appreciate well-made espresso. There are a ton of espresso machines on the market for under $200, which is partially why this is such a great price range. 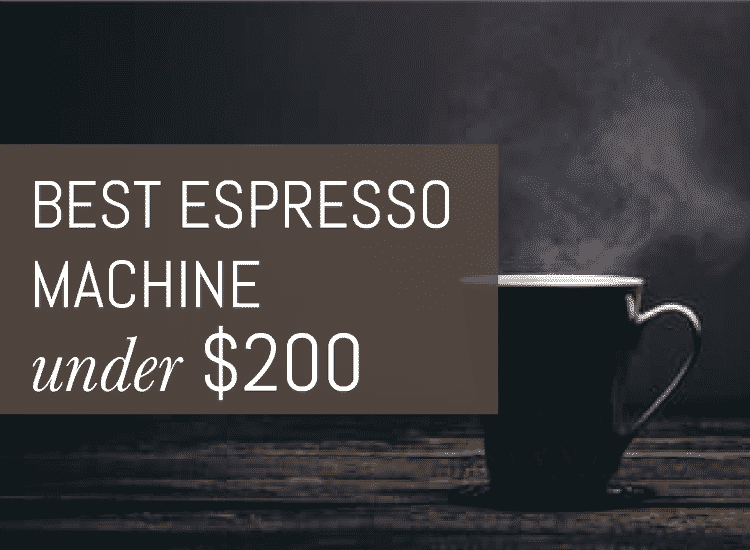 At the $200 price point, you’re not getting the expensive bells and whistles of a super-automatic machine, BUT what you do get is a solid machine that makes solid espresso. The only problem? The selection for this range is huge and sussing out the best machine for your needs can be tough when the field is so crazy big. 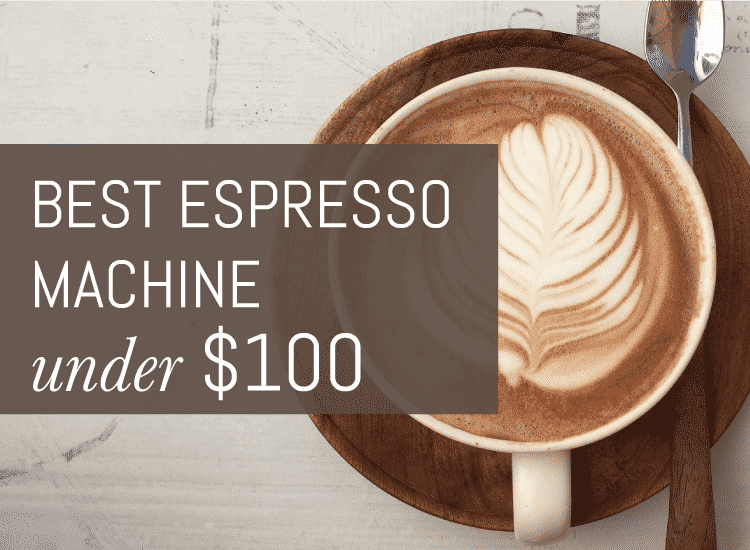 I have some thoughts on the available options and have detailed my top picks for the best espresso machine Under $200! The Klarstein Pasionata 20 Espresso Maker is the second-most expensive espresso maker listed here, but it packs the most value for your dollar. This is a newer German brand, but it’s popular with home baristas for the high quality construction and ease of use.At around 8 lbs and 15.4″ x 14.6″ x 10.6″ in size, the Pasionata is solid and well appointed, and slightly more roomy with a sturdy presence on your countertop. This is a great machine if you’re still developing your espresso game. It is simple to operate: after you’ve used the built-in grinder to fill your portafilter, either turn the dial left for espresso or right for frothing. It’s not confusing and allows you to become used to fine tuning the pack of your portafilter and the coarseness of your bean grind. It’s perfect for a busy household that appreciates good coffee, but doesn’t need a ton of buttons or automation for drink customization. The Klarstein also comes with a self-priming operation, which brews faster than most other espresso machines in this range, eliminating wait times between shots. The portafilter includes the option for single or double shot sizes and the machine is also pod-compatible. The rest of this espresso maker’s features include: a durable, high quality, stainless steel boiler with 20-bar pump pressure, which ensures the espresso maker produces proper espresso; an ESE filter, which helps make brewing quick and hassle-free; a steam nozzle, which enables you to make rich, creamy froth for cappuccinos and lattes; and a 43 ounce removable water tank that holds enough for 6 cups at one time. The machine is also pretty quiet for a semi-automatic and the pump doesn’t sound like a truck is coming through your kitchen. The brand is a solid one and has a reputation on par with the best. The genius of German engineering really shines through in the well-made, reliable simplicity of this machine. Users on Amazon are big fans of the Pasionata, ranking it a 4.2 out of 5 stars with over 50 reviews. Weighing in at a more compact 9 lbs and measuring 12” x 14” x 12.2” in size, the Mr. Coffee Café Barista Espresso Maker is another under $200 espresso maker that is both aesthetically pleasing and space-saving for minimalist or smaller kitchens. The great thing about this machine is that it is so easy to use. That’s really refreshing for machines that feature latte and cappuccino settings, which can be the biggest barrier for new users. This machine comes with a one-touch control panel that lets you choose from a single or double shot of espresso, cappuccino, or latte with the push of a button. This is great for the novice espresso-lover who doesn’t want to be overwhelmed by a million variables and brewing options they have to master on their own. If you love a little steamed and frothed milk, the Mr. Coffee comes with an automatic milk frother that will not only turn your favorite brand of milk into a light, creamy foam, but will also let you select the froth level, allowing you to customize your beverage. It even pours it into the cup for you. It do not get easier than that! I also love that this espresso maker comes with a great 15-bar pressure pump that will extract maximum flavor from every coffee granule. The Mr. Coffee is also pretty easy to clean, like most machines, it comes with a removable water tank and drip tray, both of which make maintenance pretty hassle-free. The rest of the espresso maker’s features include: a well-made portafilter, which ensures the espresso maker produces proper espresso every time; a measuring scoop/tamper, which not only enables you to brew accurately, but also helps you ensure that the ground coffee beans are put in the container evenly; and filter for single and double-shot espresso, which are greta for customizing your beverage and should always be a standard feature. The only complaint about this machine that customers have aired are its being a little loud. The Mr. Coffee Café Barista received a great rating of 4.1 stars out of 5 on Amazon, making it both the cheapest and best-reviewed espresso maker on our list. Adjustable cup tray for range of cup/mug sizes. While not for true espresso purists, the Nespresso line does have their place. They are convenient and when you don’t have time or the desire to acquire the skill set to make a cup from scratch, you can pop in a pod and you are good to go. Weighing in at 13.3 lbs and 12-3/4” x 4-3/4” x 9-3/4”, this espresso machine sports a modern, space-age chrome design, which is a breath of fresh air, considering the design of most espresso machines, which hasn’t changed much in the past decade. The Pixie (the name is a little cutesy, but the machine is great) is a super automatic espresso machine and is lightning quick – as in, it promises to brew in less than a minute. This little beast can heat water to proper brewing temperature within 25 seconds. I don’t know anything that happens that quickly anymore, especially in the morning! When it comes to power, the Pixie is equipped with a 19-bar pressure pump system that ensures as much flavor is extracted from every coffee granule as possible. Two other noteworthy features on this machine include: a heat-resistant panel that lets you place the espresso machine directly on top of the pod drawer without worrying whether it will sag or whether the heat emitted by the espresso machine will have an adverse affect on the coffee capsules stored within and a roomy 24 fl. oz. removable water tank, which makes re-filling the espresso machine super easy, storing enough liquid so you’re not refilling every two cups. While there seem to be no complaints about the espresso machine itself, customers have noted the capsules are on the expensive side. Keep in mind, this machine is just for brewing Nespresso products and does not have a frother, so it is not equipped to steam milk for a latte or cappuccino. This is a great option if you are looking for a more automated process without the grinding, tamping and extracting of your own beans. The Pixie also received a high rating of 4.3 stars out of 5 on Amazon. It is also one of the best sellers for super-automatic espresso machines,. The DeLonghi EC702 15-Bar-Pump Espresso Maker is the second-most expensive espresso maker listed here, but it packs the most value for your dollar. When you hear the De’Longhi name, you should immediately think: full-featured quality. Just 13.4 lbs and 11″ x 9.1″ x 11.6″ in, the De’Longhi espresso maker is solid and well appointed, and slightly more roomy for a larger presence on your countertop. It has a fully stainless steel casing, which is a really refreshing reprieve from endless, poorly made plastic machines. For fine-tuning your espresso game, this machine comes with 2 separate thermostats, which enable you to control water pressure and steam pressure separately. If you aren’t as big of a espresso geek and just want something tasty and easy, it also comes with De’Longhi’s patented dual function holder, which not only lets you use both pods and ground coffee beans , but also makes brewing pretty fast and easy. This versatility is a great feature and perfect for a busy household that appreciates good coffee. The De’Longhi also comes with a self-priming operation, which brews faster than most other espresso machines in this range, eliminating wait times between shots. It also features a really effective warming tray that will keep your cup warm and ready for you. I like to pre-warm my cups to keep my morning lattes hot, right as I pour the milk. The rest of this espresso maker’s features include: a durable, high quality, stainless steel boiler with 15-bar pump pressure, which ensures the espresso maker produces proper espresso ; an ESE filter, which helps make brewing quick and hassle-free; a Sempre Crema filter; De’Longhi’s patented cappuccino system frother, which enables you to make rich, creamy froth for cappuccinos and lattes; and a 44 oz removable water tank and anti-drip design, both of which make re-filling and cleaning the espresso machine no-hassle. The only complaint about this model is the necessary tweaking of the grinder settings to achieve an optimal coarseness level. I’ve found this to be the case with many espresso machines and really isn’t something to be concerned with. De’Longhi is known for their espresso machine artistry and quality. The brand is a solid one and has a reputation on par with the best. At under $200, this machine is a solid pick and won’t disappoint. This minimalist Breville option ALMOST edged out the Pixie for the third top spot, and really is a great alternative to any in the top 3. There is a lot to like and the Breville name is always a trustworthy indicator of quality and durability. Here is what you can expect from the Cafe Roma: A solid stainless construction with the standard 15bar thermoblock pump, a dual-wall filter system, a frothing wand (yay! ), and a mini cup-warmer. The water tank is about 40 ounces, which is a respectable size. The drip tray is easily removable and pretty straightforward to clean and they include the frothing jug so you don’t have to purchase separately. This machine doesn’t have quite the oomph and features of the top spot De’Longhi, but it definitely holds it’s own at this price point. The Vertuo from Nespresso is pretty similar to the Pixie, but takes the Vertuo line of capsules (NOT the original) and is configured a little differently. 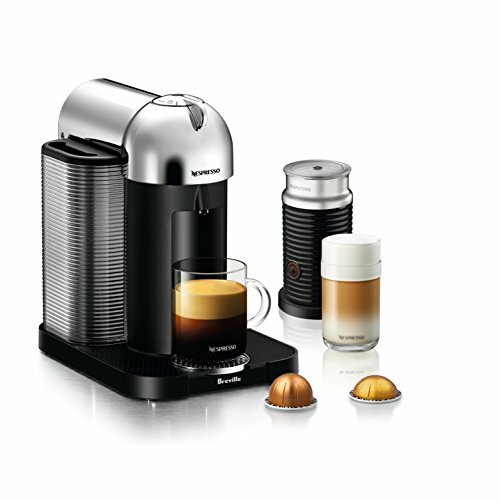 Like all Nespressos, you can expect sleek, futuristic styling and a nice, slim profile. Here is what you can expect from the Vertuo: A simple one touch brewing system, designed for single serve brewing of either coffee or espresso, a standard 40 ounce water tank, and a speedy heat up time of about 15 seconds. The limited options in the Vertuo range are the primary reason this machine doesn’t rank on the same level as the more versatile Pixie. I had to include the ROK Presso for the hipsters in the crowd who appreciate unique, artisanal design. I mean, this one isn’t winning any points for automation but it is a great option for the die-hards who want to break down the process to absolute basics. So what should you expect from this old school beast? Basically, you’re getting the portafilter, the metal ROK extraction base, and a tin to store and transport it in. It also has a cute little hand pump for frothing milk, all without the aid of electricity. This contraption is perfect for a rustic cabin or weekend camping trip where you just can’t survive without a quick morning espresso. Nespresso is dominating the top 10 in this category, but we couldn’t overlook this alternative in the Vertuo family with a few features from De’Longhi. While this machine is almost identical to the others, what knocks it down the list is that it just isn’t different enough or full-featured enough to warrant the price. Here is what you can expect from the Vertuo/De’Longhi collaboration: All the same features of the original Vertuo, a larger 54 ounce water tank and 17 (as opposed to 13) capsule used storage system. All of the usual Vertuo capsules are accepted, a more limited group than the Original line we like from the Pixie. Aaand that’s about it. We told you it really didn’t have much more to offer, a little disappointing for what could have been an exciting collaboration, but still a well-performing machine. The HB in the group falls short of the top 3 for the less durable construction, but it still ranks as a preferred performer and gets bonus points for being priced more reasonably than some of the higher ranking options. A solid pick if budget comes first. Here is what you can expect from the Hamilton Beach: A standard 15bar Italian pump, an easy slide-in portafilter, a swivel steam wand, and a small cup warmer to pre-heat your cups. It also has a slimmer profile than the top-ranking De’Longhi and more plastic parts than we generally like to see in this price range. If you love the De’Longhi name but aren’t able to quite hit that $200 price point, this more reasonably priced alternative from the same company is worth considering. The construction is more plastic than stainless, but for the price, it’s an expected sacrifice. Here is what you can expect from the BAR32 Retro: The standard 15bar pump, the option to use pods (yes! Just like Nespresso) OR grounds, a swivel frother, self-priming, separate thermostat control for steam and hot water, and a slightly smaller 32 ounce tank. I’m personally not a fan of the styling on this machine, but if you’re into a post-retro futuristic look, this is definitely going to appeal to you! The Capresso ranks on the bottom spot mainly for my disappointment with its construction and overall durability. This is the most plastic-intense of all the options we’re sharing and while it does perform well, I don’t think it has the longevity of our higher ranked options. So what can you expect? The usual 15 bar pressure pump can be found on the Ultima, as well as, a self-tamping portafilter, a warming tray for cups, programmable cup sizes, a frothing wand and a smaller 34-ounce water tank. The soupiness of the puck following extraction is the only other consideration worth keeping in mind. For this machine, it’s important to find the right espresso and grind to the right coarseness for the best result.